Varoma is a Thermomix word and it is a combination of ‘vapour’ and ‘aroma’. Varoma temperatures refers to the temperature selection on the Thermomix and Varoma dish, refers to the large dish that you use for the steaming function. The Varoma attachment of the Thermomix is a great tool to have. Aside from all of the usual functions that the Thermomix offers, I love having the option of steaming whilst cooking other dishes. I use it to increase the quanitity of food I can cook, to increase the amount of vegetables in a meal or to prepare elements for another dish ie steaming tenderloins for lunches whilst cooking rice or soup. What’s more the Varoma attachments are all included with your Thermomix. Getting into the habit of steaming can take a little time. There are a few simple dishes I recommend to get you on your way. 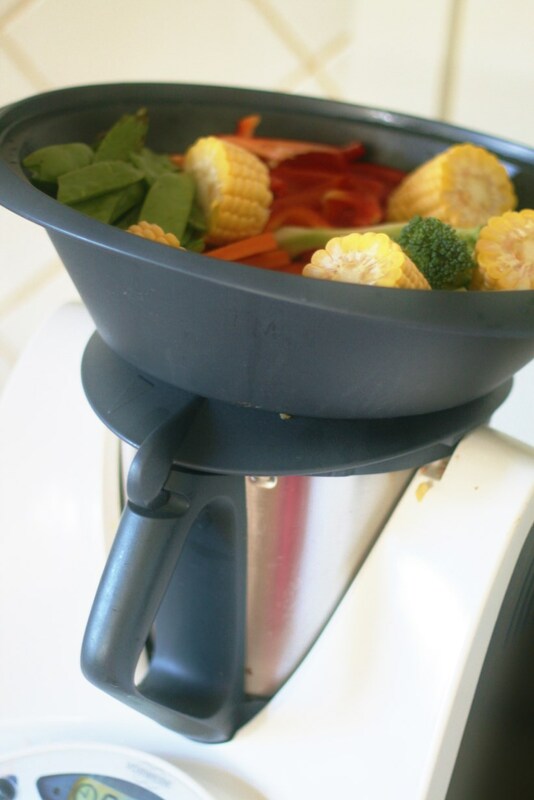 Start by steaming some vegetables next time you are cooking your rice. The 14-16 minutes it takes to cook Basmati or Jasmine rice in the rice/steaming basket (inserted into the TM bowl) is perfect timing for most vegetables. After that, try the Asian Fish Fillets in the Everyday Cookbook. A whole meal cooked in 16 minutes. It ticks almost every box; its easy, healthy, tasty and quick. The steaming function is also brilliant for any fussy eaters. A comment I often get at demonstrations is that some kids like their food cooked separately, not in a sauce or casserole. If this applies to anyone in your family, steaming is a great time saver. You can be cooking you and your partner a curry underneath whilst steaming some simple vegetables and chicken tenderloins/meatballs/fish fillets for the kids in the Varoma. Once again 14 – 16 minutes is all it will take. Once you get the hang of it you will find yourself steaming all the time. Any time I am cooking rice, soup or mashed potatoes I usually have something steaming on top. 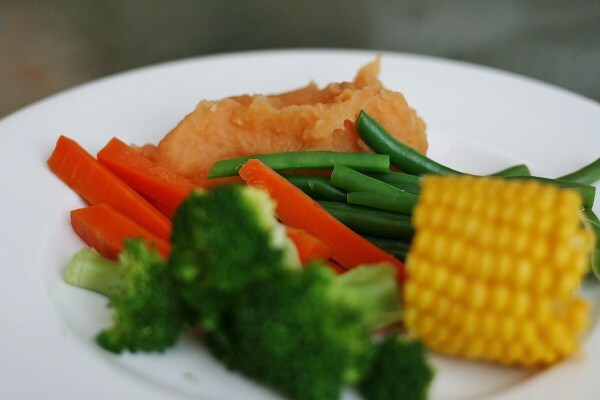 The shot below was some vegetables I steamed whilst cooking a potato/sweet potato mash. At the same time, I was pan frying some steaks. The chicken was for lunches the next day. Remember my post about shredded chicken. Other recipes that use the Varoma are my Spanish Chicken, Wontons, and Cold Asian Chicken, As part of our Thermomix customer journey we also offer a steaming demonstration. It’s kind of like your advanced cooking class that concentrates on the steaming function. Feel free to call your consultant to arrange a demo.